Marie and Vicki of Handi Quilter chat with Linda and show more mini quilts from their 2015 Quilt Challenge. Another 7 mini quilts to inspire your quilting! "Hi I'm Linda with American Patchwork and Quilting and I'm here with Vicki and Marie from Handi Quilter, and this is Part 2 of the Be the Star of your Quilt, now we talked about in the previous episode the challenge that you all put out to your educators about making a small quilt, so 20 inches, 20 inch square with a friendship star in it. Now we looked at those quilts and they were mostly monochromatic with the exception of the star. 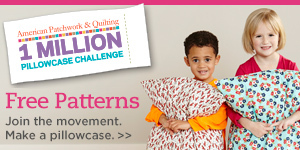 Now this set of quilts are a little bit different so let's talk about those." "Marie, this is your quilt." "So this first one is mine and you can see I had to add some color to it and balance out the star, this friendship star just seems like it's going to fall over, so for me I had to balance it out, you can see I accented that with another kind of square shaped that kind of framed it and then there is another frame outside of that, I like that it broke up or divided that space and you can tell I love feathers and pebbles." "It's very symmetrical, what's in the corners is in all four corners, it's balanced and doesn't fall over." "Oh yeah" "You feel better, don't you?" "I feel better, it's balanced." "Ok this is another one of our quilters and I'm going to have to cheat and look, Linda Gosselin did this one and she left the star but she circled it and even added a hexagon. That is a hexagon isn't it?" (Octagon, I think) "Octagon, is that 8, yes, it's octagon, good catch there." "And she used colored thread which we hadn't seen so far, really contrasting colored thread." "And the white, with the cream fabric, that could be kind of scary to do that because that's really going to show if you don't get it right. 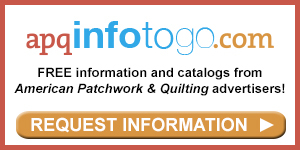 She loves using the Pro Stitcher which is our computerized quilting system and she probably created this whole pattern in the software before she ever put it on the quilt." "Well that lets you really see what you're going to get. (Yes) And then she added in other quilting here that wasn't in the blue." ? "That's right to give that background." (To balance it out a little bit.) "Yep" "And the flange?" "Oh yeah, she framed that with that piping, that little extra flange there, which I really like." (I do too, looks great.) "Alright, this one is mine, as I started this, some of them, as we talk to them about the quilts we said so what was your inspiration and some of them said, Just get it done, there was no inspiration and you told us what we could do and couldn't do. I had some inspiration on mine but then I had to change because it was a little bit too sensitive for me to talk about and so I changed mine to these are the stars in my life. My star friendships. (Oh wonderful) "Okay, so Marie asked me when I showed her this, so where am I in this, I said oh you're right in here in the big star, so depending on when you come into my life is where you are in this ? you may be a smaller star because you've been away for a while. ?But what I did was I again I had to kind of make this symmetrical and so I took the star and twisted it and then made a shadow star behind it and by us using the double batting it gave us that good channel that you can see." "You've really got some good dimension there. "And then you've got small stars that you left un-quilted, and some larger stars that again you did that channel, just one channel, and micro quilting inside." "When I finished it I just thought it wasn't complete it just needed something more so then I added the couching and it just framed it up." "Just framed it up, fabulous." "Oh, we just love this one, right? Doesn't that rust color with the blue? So this is Mary Beth and she used the different color of thread as well as the different couching but look how, I mean this is balanced." (It is) "Again she had to balance it." (She turned it into an 8-pointed star) "Then she added this beautiful motif there with the circle, very balanced." "Yes, almost art deco in feel." She still used some threads that matched that kind of just put the texture into the fabric, put that micro quilting in so that it made this design out here really stand out." "So by using the colored thread for the designs she wanted to show the most and then filling in the background with that lighter matching thread she got that texture by really letting this be the showcase." "Yes, she's a beautiful quilter." "Okay this one, she just used a very subtle blue, even lighter blue than the star, just to give those rays going out there, each area has a different design in it and left some un-quilted so that really pops, really stands out and she tried to make this again, make that symmetrical." "Right put in a little extra. The symmetry or the asymmetry of that friendship star really threw a lot of people off. That was a big challenge." "So circles were a big thing." "Yeah and that was Susan Jungerheld." "Okay and this one is Megan, right, Megan Best. And don't you love that color, it's my favorite color, I love that color that she put there and then to accent it with the design inside the stars and the change in size, boy that just draws your eye right to it." ? "It really does. And now she couched down some metallic thread around those star edges too." "It kind of gives it a little more pop." "And then also put some small stars there too and did some straight line quilting across, really gives it a nice feel." "A modern effect. It really pops out doesn't it? (It really does.) I love what she's done here, and I think she did this with a Pro Stitcher and then just cropped the design to get that shape." ? "To make it end. Perfect. And another one who did some straight line quilting and maybe broke a few of the rules." "Our little renegade here. This is Diane. 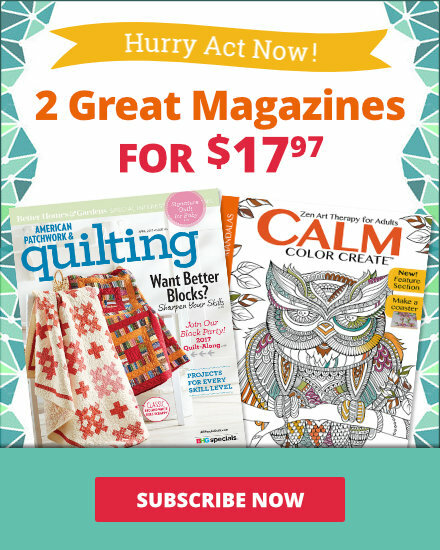 But Diane is no longer one of our educators, she is now a sales person for Handi Quilter, so we're going to give her a little slack, we didn't even expect to see it." "We're so glad she did it because it's so unique." "She took the tree and she took the cue from the fabric and placed the tree in there, of course she took the cue for the binding that is red from the birds and did that straight line quilting, and one of the things she said to me was Oh I didn't get them all the same distance but I really I like it, I like the difference." "I think it gives it some character because you've got some wider areas and some narrower areas, gives it a little more texture." "One comment, she said why does that do that?" "It's kind of poofy." "It's because she quilted so much right in there that the rest of it and it's probably (a fusible) so it made it a little stiffer." ? 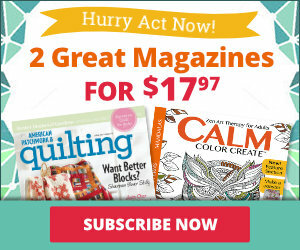 "Might make a little difference in how the quilting takes or how the fabric reacts." "But you know what? I think it's awesome." "I do too." "So try to pick a favorite." "I can't, I think they're all so different and so unique and I think it really does show that when you challenge people to really do your best with this great idea you really do see their star shine, and I think it's a great idea to challenge your friends or yourself to try some new things on these smaller size blocks and really practice your quilting, try something new and be adventurous."